FAQ's | Beautiful Baths | Remodeling Made Easy! Q: We have an old, dated bathroom, but we don’t know where to start? Where do we begin the process as we have no idea what things cost and what can be done? A: The first thing is to arrange for us to come by your house to view your bathroom to view the situation. We have an in home lap top system that we can show you available products and we can price up various ideas for your bathroom to help you gets started. 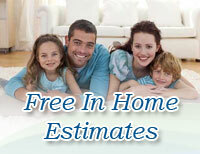 This is a free in home estimate with no pressure from us. We can offer many solutions for your bathroom and don’t push you into one specific product; we first determine what would be best suited based on your needs and budget. Q: I have a tub that is Green (or some other color) that we don’t’ like, what can we do? A: There are several options; you can do a simple, cost effective process of having your bathtub refinished where we come into your house and restore your bathtub with our unique Kott Koatings bathtub restoration system. This will save you significantly vs other solutions but typically only has an 8 – 10 year life. Another popular option is the acrylic tub liners that have lifetime warranties and offer a longer life than a refinished tub. Also, there is the option of installing a new bathtub, but if you are not planning on re doing the walls around the bathtub, this may not be a viable option. Q.We are remodelling a bathroom and have ceramic tile on the walls in the shower enclosure and also about four feet high throughout the rest of the bathroom. We do not want to have to go through all the work of replacing the tile. We were wondering if we could just paint it? A. Yes , we can Refinish ceramic tile that is not damaged and is sound; When we come to your house we will inspect you tile and offer you solutions. Q. I hate dealing with caulking and cleaning our tiles and grout, but we do not want a cheap looking surround; what can we do? A: There are several options. Most homeowners are enjoying the benefits of acrylic walls as these are easy clean, long lasting and look gorgeous. There are various systems and products we use, some are “seamless” and some are “flexed”. There are pros’s and cons to each. We would be happy to evaluate your bathroom when we come. for your free in home estimate. Q. Can we purchase our own products or do we have to buy our products from you? A: We are happy to install any products you would like us to install as we are very skilled with installing many product lines. Q. We’re considering renovating two bathrooms. One will be a shower-tub and another just a shower. We’re low maintenance, no-frill people who care more about function than looks. We’re having challenges deciding on what material to use for the walls that would be low maintenance. Do you have products to meet our criteria? A. Yes. We offer many solutions to feet customer’s budgets. Q. I bought a corner tub and I want to know if it’s possible to have a shower head on the wall or ceiling instead of just the hand held one. I also don’t know how a shower curtain would work with that? A. This can be done. Give us a call for a free in home estimate as this needs to be completed by a professional .We have many products to offer and solutions to problems such as this one. Q. I’ve heard stories of renovation work that went on for several months. Will this happen if I use your company? A. 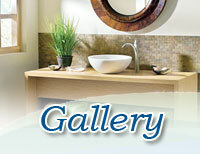 We specialize in bathrooms and thus we make things happen in short time frames. Some things are one day installs and some things might be a few days depending upon what is required. Our motto is “remodelling made easy”. Q.Do I have to remove my old tub? A. No, there are several options. The beauty of the Tub liner system is that we can identify your existing tub and make a new liner that will be vacuumed formed to the same shape of what you have in your home. Instead of tearing out 300 pounds of cast iron and making a huge mess, we will use your existing tub as a perfect base that will receive your new liner like the perfect fit of a glove. This saves you time and money with the added benefit of having an insulated tub that keeps your hot water hot. Best of all, the number one comment of satisfied customers is that it is so easy to clean and still looks like new after years of use. Can’t beat that with any other product! Q. How long does installing one tub liner take? A. The installation time for one tub liner is just one day! Q. Will I be able to use my tub the same day? A. We recommend not using the tub until the next day to allow proper sealing of areas in the installation. Q. I’ve redone everything over in my bathroom except for the tub and walls. Will I lose any of my work and investment? A. No. we can renovate the tub and wall area without disturbing the remainder of the room. Q. Will acrylic hold up in a busy household with teenagers? Will it last? A. YES. 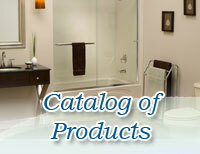 Acrylic is the highest quality material used in bathtub products. It has a 30+ year life expectancy. We also give you a Life Time warranty on materials. Q. Is Acrylic easy to clean? A. YES. Acrylic is a non-porous material. Unlike fibreglass or porcelain, it doesn’t collect soap scum and dirt. It is the easiest cleaning surface known today in bathtub products. Q. Does it stain easily? A. NO. Our Acrylic with Luxsan® and Microban® bathtub walls and liners are highly stain resistant. Q. Can you do anything about my walls? A. YES. We can custom fit our acrylic wall system with the same beauty and quality as the acrylic tub. Q. Can I add a shower to my tub? A. YES, if acrylic walls are added. Q. Is the acrylic tub bottom slippery? A. NO. A slip resistant bottom is standard on all of our jobs. Q. Can a one-piece fibreglass tub be replaced? A. YES. We have a system to do this.